Throughout time, artists have found countless sources of inspiration. Sometimes it comes from the world around them; the song of a bird, the curve of a face, or the color of a flower have all inspired art. Other times, an idea springs from something that is already integrated into an artist’s culture such as the lilt of a folk tune, an archetypal myth, or even a work by another artist. Artistry that stems from an extant work of art sometimes leads to mere imitation rather than interpretation or innovation. Imitation in the form of direct copying can be a wonderful tool for learning. It has long been standard practice for art students to replicate the work of the masters. This might happen through an apprenticeship, a studio copy book, a workshop, or in the gallery of a museum. But it has always been understood that those who copy in order to learn move on to create their own work. Making a replica of another artist’s work is very direct, but tracing the influences and stimulus behind an artist’s own creations often is often more circuitous. Art of one type might prompt something entirely different such as the composer Modeste Mussorgsky’s 1874 score, “Pictures at an Exhibition,” an evocative piece of music based on the composer’s visit to a gallery displaying paintings by his friend. Or, artists might consciously and unconsciously inspire and influence each other such as when friends, Pablo Picasso and Georges Braque, developed their Cubist styles. Other times, inspiration comes just from an awareness of a similar genre. The work of Steven Ford and David Forlano (F/F) offers a wonderful example of this third type of artistic impetus. 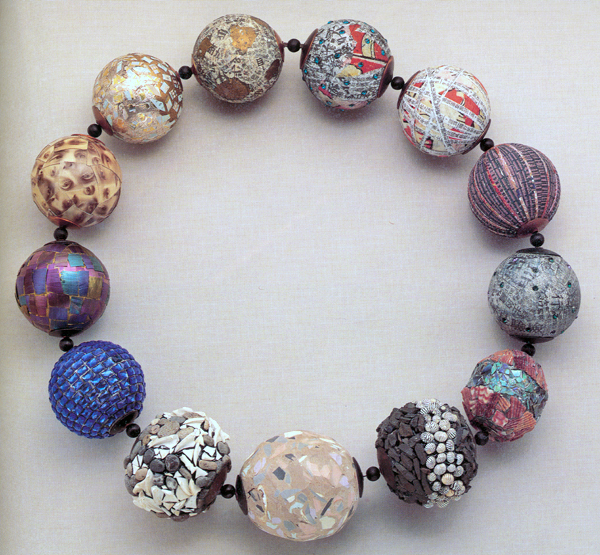 In 1988 Robert Ebendorf, a well known art jeweler, created his “Mixed Media Big Bead Necklace.” This necklace, with its two inch diameter beads made from bits of seashells, cut glass, slate, old photographs, and chips of plastic laminate, became notable for its very wide range and blend of unexpected materials as well as its oversized scale. As Steven Ford relates the story, the original impulse behind F/F’s own big bead compositions occurred while he was in the art gallery, Mobilia, showing the owner, Libby Cooper, some of their work which happened to be clay covered chicken eggs. Libby suggested making a necklace with really big beads such as Ebendorf’s which Steven knew from photo reproductions. As with many ideas, there often is a period of germination. F/F carried the idea of big beads over a span of years. By 1998, they had completely assimilated the concept, interpreted it and created work that was wholly theirs. Like Bob Ebendorf, whose beads exhibit a wide range of surfaces and a fair amount of color relative to metal work, Ford and Forlano’s big bead necklaces also display a large number of visual effects, textures and a decided palette of color. 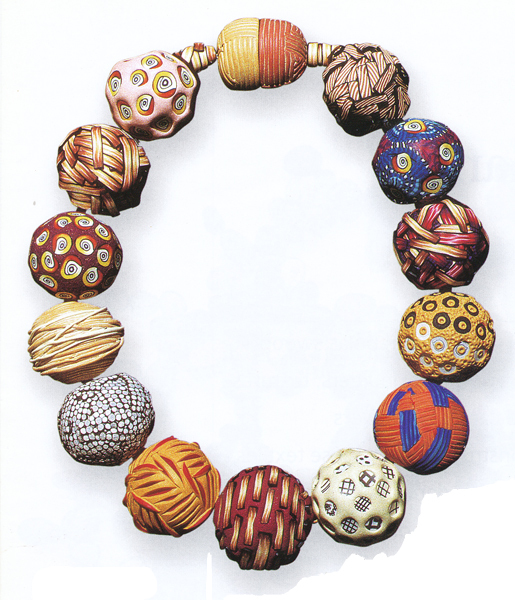 But, unlike the eclectic materials list of Ebendorf’s beads, those of F/F are made entirely of polymer. Every variation is a product of F/F’s skilled manipulation of the medium. Black and white cane work has been part of F/F’s creations since their earliest collaborations in polymer. One of their 1997 big bead necklaces is an extended exercise in black and white. Tiny square tiles of different canes cover a core bead to create a range of tonality as well as textural effects. Yet, none of these beads are exclusively black or white due to the subtle variations of graphic pattern and layering that comprise their surfaces. 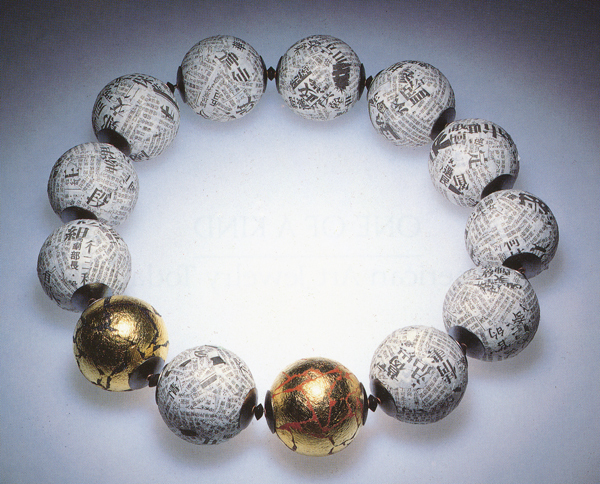 Aside from the graduated sizing of the beads, the overall approach recalls Ebendorf’s Mixed Media Necklace (above) as well as an earlier piece of his, Necklace 1985, in which the beads are covered with black and white Japanese text printed on rice paper. Graduated bead size is also present in another of F/F’s big bead necklaces. Here, the textural emphasis is decidedly more pronounced. Small bumps, inter woven ribbons of clay, cut out layers and incised patterns are all represented in addition to flatter, caned surface patterns. The color scheme is more vibrant than that of the black and white necklace, but remains within a range of gold and red tones with some contrasting color accents. 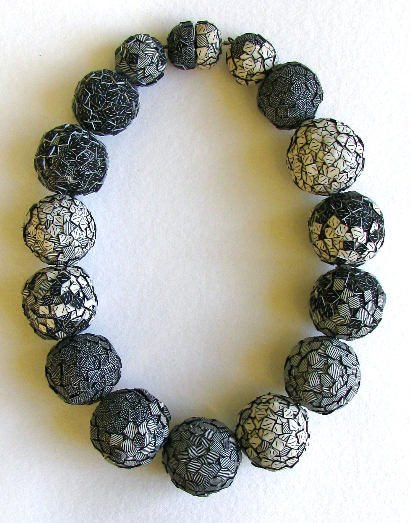 Unlike the consistent technique of surface ornamentation in the black and white necklace, in this piece each bead has become an individual composition. 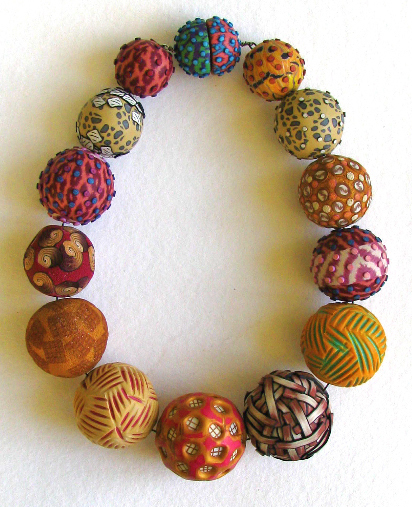 Every bead is decidedly different and whether the surface exhibits a caned pattern or multiple layers of techniques, together the various beads combine to make up a coordinated whole. A uniform bead size with a wrapped clasp connection comprises a third example of F/F’s continued interest in the big bead concept. Utilizing a mostly blue color scheme, the beads in this piece are complex in appearance and work especially well together. Accent colors repeat regularly, as do elements of pattern and the surface motifs of weaving, wrapping, and layering. Round cut outs and round applied canes appear throughout and mimic the roundness of the bead forms. There is strength in its total effect and despite the many variations of beads, it presents a unified composition. By 1998, F/F were well into their exploration of the big bead necklace. 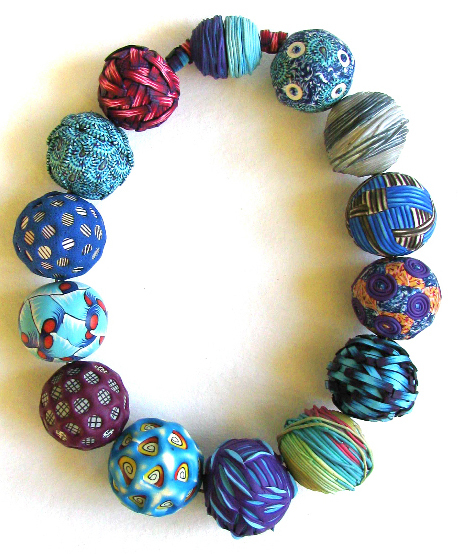 An over sized bead, with multiple complex surfaces and a limited range of colors, became the basis for their dynamic and distinctive compositions. 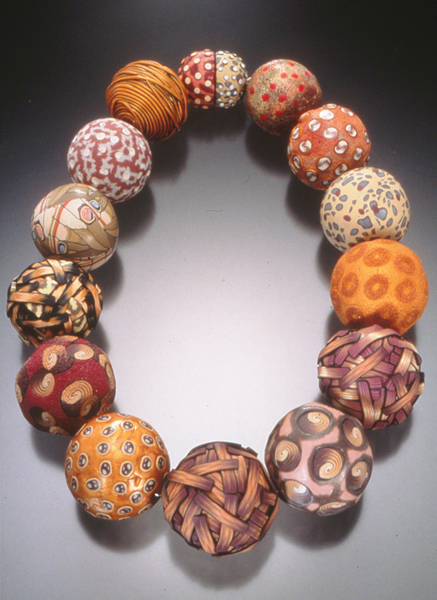 Since then, F/F have continued their interpretation of the big bead necklace in ways that are uniquely their own and have moved way beyond the original inspiration of Bob Ebendorf’s 1988 work.